Back to the topic of myopia which was the subject of a blog post a few months ago, and can be read here . Singapore's high rate of myopia appears to be largely due to our lifestyle, and it would be good for all parents and nannies to be aware of what measures can be taken to reduce it. 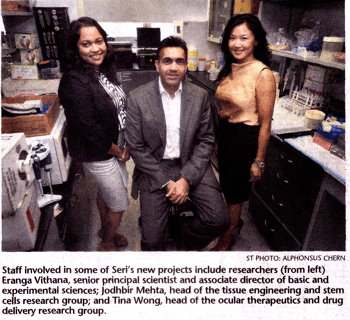 The Singapore Eye Research Institute has just completed a study which discovered that applying eye drops containing a very weak solution of atropine managed to decrease the rate progression of myopia by about half. In some cases there was even an improvement. This is great news, because even though we may now have a reasonably good idea of how lifestyle can affect vision, it is not an easy thing to get people to make changes to, even if they are motivated to do so. The species name "belladonna" ("beautiful woman" in Italian) comes from the original use of deadly nightshade as a way of dilating women's pupils to make them beautiful". Apparently the new treatment won't be ready until the middle of 2013 after another round of trials has been completed. Good news for us short-sighted Singaporeans, but while waiting for the eye drops to hit the pharmacy shelves... Go outside!